Published on 10th April 2016 . If you DO struggle with toileting, don’t worry. You are not alone. Statistics show 2,750,000a households with a disabled person need a home adaptation and toilet assistive devices. Bathrooms are the most common form of home adaptation, with 20% of disabled people in private households using themb. 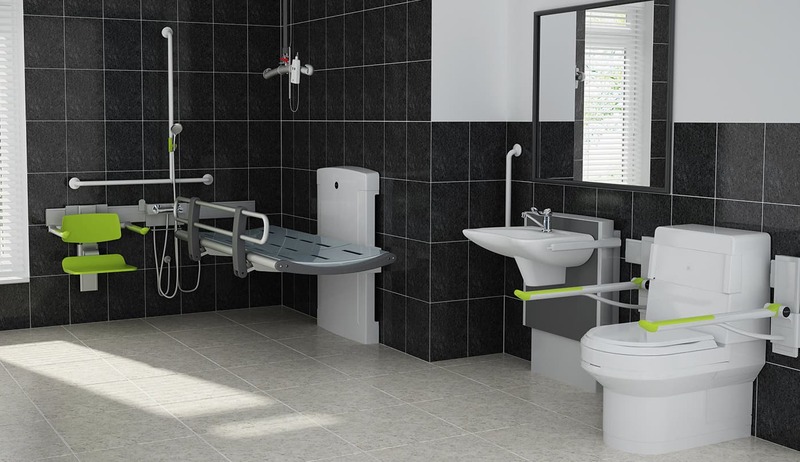 When fitting toilet assistive devices, walls especially need to be strong enough to support the fixture eg washbasin, grab rail, and remain secure when your full weight is potentially pressing down on it. Modern stud walls need to be checked by a professional to ascertain suitability for wall-mounting of such fixtures. Alternatively choose a floor-standing variant. And make sure your grab rails or support systems are comfortable, for your own safety and ease of use. Modern products are ergonomically and aesthetically designed, so can look smart as well as feel comfortable to use, rather than being solely functional. This really only applies if you are replacing a bath with a shower, especially in a first floor bathroom. For longevity and suitability for potentially changing needs, go for a level access shower, or wetroom. But bear in mind the water needs to drain somewhere, and needs a gradient to do so effectively. if you use a walking frame or wheelchair, you’ll already know the frustration of overcoming even a tiny lip or variant in height between floor areas. So make the doorway level, and choose a level access shower so you can easily get in and out without any, or little, help. Bright colours and ‘bobbly’ surfaces add aesthetic appeal but are really useful as our sight deteriorates! Beware, shiny/glossy tiles can reflect light and often cause glare, it is worth considering whether matt effect tiles are more appropriate. Different colours can be used to define different areas, on the floors and/ or the walls. Products with tactile features such as raised bumps, dimples or touch sensitive controls are also available to assist with the use of equipment such as shower controls, wash hand basins and or toilets. And there are some products on the market now that are also offering auditory guidance making toilet aids even easier to use! Once all the toilet assistive toileting technology equipment is in place, there needs to be space for moving round the room. Think about the doorway: it needs to be wide enough to get through. The door itself may impinge on available space to move around inside, but a conventional door could be replaced with a slider to give some valuable extra manoeuvring space. If you are using, or going to be using, a frame of wheelchair, how will you ‘transfer’ from it to the WC, shower? Which way will be the most comfortable for you- left or right? If a shower seat is used, do check it will fit over the WC, as both vary in height! A toilet can usually be adjusted upwards by adding a plinth or two. Plan it right, and toilet aids will help you remain independent, with privacy, for years, and be able to evolve as your needs change. If you would like more information on toilet assistive devices, toileting and toilet aids, please speak to Clos-o-Mat who will be pleased to offer you some guidance. 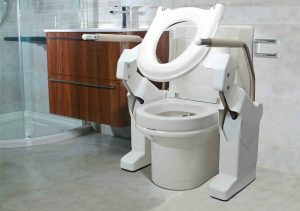 This blog was written by Robin Tuffley from Clos-o-Mat, Britain’s biggest manufacturer of toilet assistive devices and toilet aids for elderly and disabled people. We have a range of blogs, many written by our readers, from both a personal and professional perspective. Each one focuses on a different issue related to care. Please click on the topics you are interested in below. This blog was also posted on our Google+ page.